Feigning to be wearing PJs, you can show up in stretch pants and thereby begin the evening already with an elastic waistband. You don’t need to pretend that you have any self control since no one has to drive so you can consume as much wine as you possibly can. The next morning you all get to wake up, relive the funnier moments of the evening (“Remember when Liesel told her adorable little dog that was just sitting there to ‘Shut Your Face! '”), and then enjoy a boozie brunch, while still wearing said stretch pants. Yes, they are a brilliant invention indeed and I intend to bring them back. Hold onto your hats ladies, this could get wild. These scallops were not slumber party fare, but I did make them a few nights ago and they are out of this world. I had something similar at Matt’s in the Market a few months back (Sea Scallops, Bacon Grits, Chanterelle Mushrooms, Fried Leeks) and was determined to recreate it ever since. This was pretty damn close and just as delicious. It isn’t inexpensive to make because the scallops and chanterelles can be a bit pricey, but it’s definitely worth the splurge and a great dish to make if you want to really impress your guests. Serve with a white wine such as Tru’s Chardonnay which was perfect with it. To get as much moisture out of the scallops as possible, set on a paper towel and set aside. In a large, non-stick skillet melt 2 TB butter and add the chanterelles. Cook on low, stirring occasionally until tender, throw in the wine and lemon juice and stir until evaporated, keep on low to keep warm and give it a stir every now and then. Try and resist the temptation to eat the mushrooms right out of the pan. Meanwhile, in a large saucepan over medium heat melt 3 TB butter. Add the onions and cook, stirring, until translucent, about 5 minutes. Stir in and bring to a boil 2 cups chicken stock and 1 cup water. Stir together remaining 1 cup water and 1 cup cornmeal. Gradually add the cornmeal mixture to the boiling water, reduce the heat to low, and cook stirring constantly with a wooden spoon, until the cornmeal is very thick and leaves the side of the pan as it is stirred, about 20 minutes. Add in bacon and cheese, and stir until combined. Put the pan top on and remove from heat. In a cast iron skillet melt the remaining butter until very hot (nearly smoking), add the scallops, being careful not to crowd the pan (cook in batches if necessary) and cook until carmelized and golden, but not rubbery, about 3-4 minutes if you’ve got your pan hot enough. 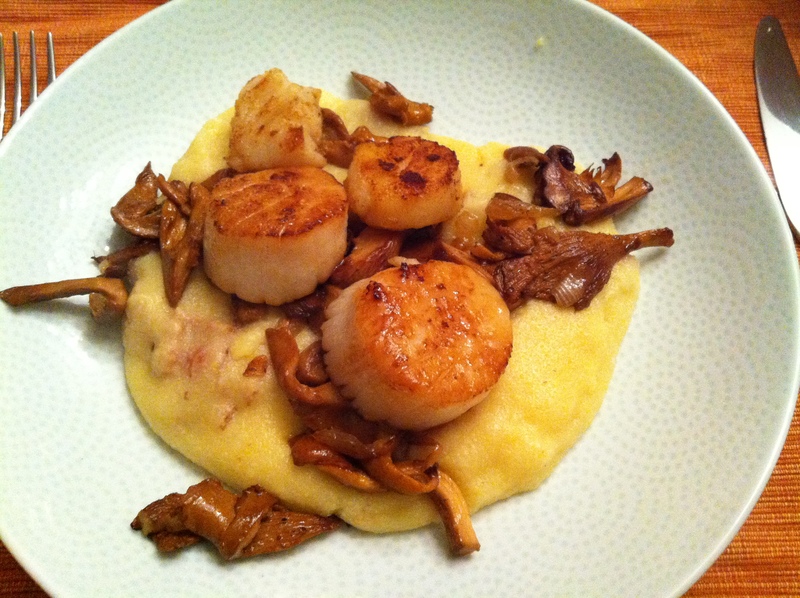 Plate the polenta, add the chanterelles, and top with the seared scallops. I want to have a sleepover and drink wine and eat polenta. Ugh – why do we live on opposite sides of the country, again? I forgot. Because we’re dumb…really, really dumb. When are you coming to visit?!?! Those scaahhhlups are wicked good. So when did you say you were cooking me this meal? How about we do a holiday dinner between x-mas and new years and I’ll make this?!? I particularly enjoy the stretch pants part! Admit it Paul…you’ve got a pair at home! All I remember from slumber parties was way too much candy. Mmm, scallops would definitely be more my style nowadays. Too much candy, staying up too late, going home grumpy, and then begging your parents to let you do it all over again next weekend! Thanks for reading Carolyn! Perfect combination: scallops and chanterelles! A sumptuous dish—beautifully done. Thanks Nancy! They were pretty dang tasty…excited to check out your blog as well. It’s Re-Post Friday! Seared sea scallops on bacon polenta?! Are you kidding me? Thanks Mary! This is great! I’m with Rachel…..why do we live on opposite coasts?? Fantastic scallops here (ok, I will admit, chanterelles are more likely found at Pike’s) but………………….Zumi’s, Tendercrop, Appleton, Goodales. Crane’s. The North End, Passports………….full to overflowing!! All excellent points Maman, and not the slightest bit biased! I will say if we had Tendercrop here I would get into some serious trouble…I think I wanted to buy about three of everything I saw. Pumpkin bread baking in the oven, fire roaring, and dogs snoring on this snowy day #2 in Seattle!